... to ex-Legend Rosie Randfield who, I've just discovered, was awarded the ‘Player of the Match’ Trophy at the final of last month's Army Inter-Corps Trophy. Rosie, playing at full back, was described as "enterprising and skilful" in the official match report. Unfortunately it wasn't enough to enable her team, REME, to retain their trophy as they lost 20-10 to the Royal Logistic Corps. The 2011 European Trophy kicks off tomorrow in Corunna, in northern Spain. Eight international teams will be playing four matches in eight days in a genuinely fascinating tournament that is really unpredictable and could go any of four ways. Though England return to the tournament for the first time since 2008 they are not the favourites. RFUW have stuck to their policy of sending their "A" team and, though the squad includes six Six Nations stars, the bulk is made up of up-and-coming development players. Though they are still as strong as most international 1st XVs, the gap is far closer and victory certainly cannot be taken for granted. This is particularly true because, though Italy - who England open against tomorrow - have also officially sent their "A" team, it is squad that includes 17 of the 22 players that beat Scotland and Wales, and pushed Ireland and France close, in this year's Six Nations. They are quite capable of springing a "surprise". Also taking part - but in the other group - are hosts and current champions Spain - who have a great record in this tournament since they were chucked out of the Six Nations (effectively on the grounds that their men's team wasn't good enough... go figure...) - and France, who are effectively at full strength and must start as tournament favourites. The other four teams - while unlikely to reach the final - are also worth watching. Sweden and Netherlands will both be fielding young squads, partly because they are concentrating on sevens, but also (in Sweden's case) because they are rebuilding after the World Cup, while Russia are something of an unknown - though not anything as much of an unknown as Finland, who have never competed at this level before. For the first time you can follow the tournament on its own Facebook Page, as well its own website, and a results page on the FIRA website. Two out of three are in Spanish, but Google Translate does a fair job. Unfortunately there will be no streamed video. Former Legend Chloe Baker tasted glory at the Home of Rugby on Wednesday when Leeds Metropolitan University's women's rugby team secured the BUCS Championship trophy at Twickenham. Her team (without her) had only managed runners up in the past two finals, but with Chloe on the team they defeated Exeter 34-5 in a thrilling encounter at a sunny Twickenham Stadium - full report here. 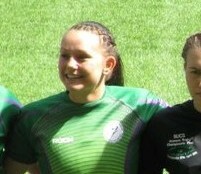 Three ex-Legends had made the semi-finals, but Jess Robinson's freak injury before she was due to play Chloe's team, and Sasha Acheson's Cardiff's shock defeat to Exeter ensured that only Chloe would be the only Legend to play on the Twickenham turf. U13 Age Band. The anger grows. If you thought that the introduction of leagues last year caused a bit of a fuss "you ain't seen nothing yet". Last year's rumblings are peanuts compared with the reaction to Wednesday's announcement and the appearance yesterday of further details (see here for the new U13 playing rules). Regular correspondents, not normally known for their written invective, have been swearing like troopers, while at least one leading Hertfordshire coach has been proposing what comes close to outright mutiny. Any RFUW officials planning to attend Herts and/or National Seven may need some serious protection if one or two people get anywhere near them. And you cannot blame them. The leading clubs in Hertfordshire (and I dare say across the country) have been carefully nurturing and encouraging girls currently in Year 7 to move over to the girls' game next season. Many have had on-going programmes for years in local primary and secondary schools that ensured that girls leaving at the top of the U15 band were always replaced with girls coming in at the bottom. The effort these clubs put in is astonishing, impressive, effective - and has been a complete waste of time. I will avoid naming names as fear of RFUW reprisals continues, but I must pass on some of the reaction. Another club tells of a superbly talented girl, with years of rugby experience in the minis - a potential England player (and this comes from a coach who knows both real and potential England players) - who has been preparing to move into U15 rugby next season but who has now already said, as a result of this week's announcements, that she does not want to play any more. What really gets me, though, is the basic thread woven into all this - and that is that the problem with recruiting girls (and actually boys too, going by other proposals in recent years) is that they are scared of contact. So, if you reduce (and all but eliminate) contact from junior rugby you will get more junior players. This is utter tripe. First, they will have to start playing contact at some point - unless adult club rugby is going to move over to tag as well - so if any girl or boy is going to drop out of the game because they are frightened to tackle (or be tackled) then they will just drop out later. All you are doing is delaying the inevitable, while maybe artificially boosting player statistics (hmmmm....). It also ignores the basic reason about why children - and especially girls - play rugby at all. You ask any rugby player, or read any interview with girls or women who play the game, and see why they took it up. Every single one - every single one - will say the same thing. Its the contact. No other girls team sport offer this - it is rugby's "USP" (Unique Selling Point). It may not attract all girls - it may (indeed probably does) put the majority off - but for thousands of girls across the country for the past 20 years or more it has been the reason why they have taken up the game. This is the siren call of a sport whose officials have no confidence in either themselves or the sport they run. Fact is that you cannot have a sport that appeals to everyone. Some people are scared of the hard ball used in cricket - but that sport's authorities are not forcing teenagers to play with tennis balls in order to "attract more players". That there are some children with a fear of water is not sufficient to make swimming clubs empty their pools so as to boost numbers. Just because boxing is a minority sport has not panicked that sport to ban punching, any more that fear of speed has forced motor racing to have speed limits. Every sport has something special about it - and for rugby it is contact. Whatever the new U13 game will be - this unadventurous, committee-designed, grab-and-tag, non-kicking, anti-septic, pasteurised travesty - it won't be rugby! It may attract new players, but they are unlikely to be the sort of girls who will want to move into the full contact game - and they will join the game at the expense of girls who DO want, or who would be attracted to, contact - but will find in this wishy-washy pap nothing that attracts them at all. And is it is these girls - the outgoing, confident, adventurous girls - who are the future of the England team. The days when international stars learnt the game in their teenage or university years have gone - as far as I am aware EVERY member of the current England team started playing in the minis. With U13 girls rugby being such a step backwards from U12 minis how many future Pococks, Scarratts and Spencers will now turn to other sports for their excitement? The new U13 age band. It's worse than you could have possibly imagined. Yesterday I gave RFUW the benefit of the doubt with the new age bands. A lot of questions were unanswered, but even so it was good to see this hitherto ignored age group taken seriously - and apparently there had been pilots run, so it was not another off-the-cuff, ill-considered, un-thought through depth charge for the junior game. Oh how wrong I was. How very, very wrong. I mean, it is a well known fact - even the RFUW have said so - that the U15 band has had its problems in some areas with not enough players to form viable teams - you may have recently read the example of the disastrous U15 league in the North East. So, given that how could you possibly make things worse? Well, how about removing one third of the players from the U15 band. Yes - the RFUW's solution to the player number problem is to ensure there are even fewer players! Incredibly, unbelievably, from next September the U15 band will be cut from three years to two - only girls from School Years 9 and 10 will be able to play U15 rugby. And, while you are reeling from that body punch, along comes another. The U13 band will ALSO be only two years - so instead of having one barely viable team, the average club will now have two. Moreover, these groups of girls will not only be banned from playing with each other - they won't be able to train together either (well, not contact anyway). So that means its utterly useless as a means of keeping girls who start playing rugby in the minis (you know - the place that practically every member of the current England Squad started playing) in the game - providing an alternative for dedicated, talented girls marginalised by coaches because they will not be part of that clubs (boys' teams') future. Not sufficient to knock the junior game to the canvas? Okay, well why not take this for the knock-out punch... U13s won't be even able to play contact rugby! What they will be forced to play is, basically, tag rugby without tags - sort of Frankenstein's monster of touch and tag combined (you grab hold of the ball carrier for two seconds and the referee calls "tackle", then turn and pass). The only glimmer of light is that there is a small loop-hole - this only applies to clubs. Secondary Schools can still play to the rules they currently use (though RFUW will be "encouraging" them to switch backwards to primary school tag). So get on to your PE Department now! And by the way, if anyone thinks I am being alarmist then within hours of the details coming out I had heard from coaches at three clubs - one in Herts - who have said, for example, about how they had Year 6 girls looking forward to joining their U15s squad next season who are totally uninterested in playing touch. I have also heard about how clubs had been working hard in their areas to balance players being lost from the top of their U15 age band by new girls coming in at the bottom... who now will not be allowed to. RFUW have announced today that, from September 1st 2011, a new Under 13s age band will be introduced for girls’ rugby in England. You can read the full press release on the Herts Girls blog. While it is great to see RFUW taking action to bridge the Year 7 gap, there is a positive tidal wave of questions that the Release does not answer. For example, we must assume that the U15 and U18 bands will remain, so there will presumably be a one year overlap in the U15 band, but nothing is said about this. There is also no mention about how wide this band is - three years, like the other two (so covering School Years 6-8)? Will there be competitions of any sort, for teams to play for? County teams? Or will the girls just play friendlies (no bad thing!)? And while we are about it, what set of rules will they play to? Should a club's Year 8 girls play U13 rugby, or U15 rugby? Will they have to choose, or can they play both? On the same weekend? I think we can assume that a U13 band was chosen (instead of the "unofficial" U12 band that has been in use in Hertfordshire for the past 4-5 years) because it is thought it will have more girls in it - though I remain unconvinced about that. The advantage of a U12 band was that it gave a home for girls already playing club rugby at the crucial age when they start feeling marginalised and drop out. However, the decision is apparently the result of years of several pilots so presumably the feedback has been good. There has been some more feedback on the leagues and, rather than let it remain hidden away on the response page, I think its worth bringing it into the full light of day here. It also concerns rugby in the North East, an area this blog rarely covers (because they rarely write to us), but nonetheless an area that always used to be a hotbed of the game. But not for much longer, it seems. ohh the league system! !..up here in the frozen wasteland called the North East not only was the weather cold but also the help from the rfuw! It was not coach developmennt that the clubs wanted it was players and the RFUW World Cup legacy has been akin to taking out an endowment mortgage - no return and no investment!! Just prior to the leagues being forced upon everyone a reasonable fixture list had been established with Cumbrian and Scottish teams! However cumbrian girls rugby imploded. I coach the Morpeth and Morwick teams. The Morwick fixture list included Tynedale,Darlington and Tyne valley. Tyendale and had difficulty putting a team together and playing 5 a side is not fun!! Tyne Valley had two players and then decided to cluster with Darlington for every fixture so in effect Morwick played Darlington 4 times not knowing which club fixture this was meant to be! !..but no game was played at 15 a side. The same farce was repeated at u15 level. As for player development! !..50 point victories are extremely hollow for players and coaches and I have nothing but admiration for players that keep playing week after week when faced with a sizeable defeat! But have those players developed? I seriously doubt it! Have the victorious teams developed? Unless the referee or coach tried to condition the game for the stronger team I doubt whether any player has improved their skill set! The resources available in terms of player interest,catchment and organisation in the North West and south of England is tremendous (south = south of scotch corner) and in the North East we do look at you with jealousy! But we have not yet given up and our aim for next season is to find more girls,more fixtures and more fun!!! But we will have to travel further and probably go to Scotland!!! PPS Thanks for the info on the RFU playing calender and their ideas for next season, somehow they seem to forget the North of England! Great summary of the leagues for this year, hope the RFUW use your analysis to move the game forward. Surprised that other readers have not commented on your summary. Agreed. The RFUW need to seriously reconsider this system. It does not benefit the players at either the top or bottom end. Another statistic you could have looked at was how many supposed 15 a side games were played by fewer numbers of players. For teams trying to maintain and develop competitive squads, it's dispiriting to find the opposition fielding only 11 players or fewer. The only positive development this year was the Rugbyroundup website. 1. What clubs want are fixtures, not leagues and the complexity that involves. They just want games - and the simplest solution to that would be for RFUW to provide a fixture service. Its not that hard - all you'd need would be a website allowing teams to list their free dates - indeed the Warwickshire & Leicestershire RFUs already provide exactly that for their clubs! 2. To add a bit of competition, regional festivals bringing clubs together every few months (not just at the end of the season) - you know, like the festivals at Westcliff and Beckenham, and the Sussex and NLD county festivals and so on that RFUW killed off with their various initiatives. If any clubs did want leagues then help them arrange them - but don't rush in to take over. In short, be an enabler not a dictator. One size does not fit all. Okay - want to raise a bit of money? Well why not follow the example of these American women's rugby teams and get into the Guinness Book of Records! Williams College and Keene State College in New Hampshire recently played a game which Williams won by 818 points to 711. No - that is not a mis-print. Over 1,500 points were scored in the game... but that is not the record. The record is because they played for over 24 hours without stopping. Also, although they made full use of the substitutes bench, with players rolling on and off in shifts, both squads were limited to only the official 22 players. The game began in pouring rain at 8am on Saturday morning, and finally ended the following morning after 24 hours, 5 minutes and 15 seconds of play - with the teams' charities $10,000 better off. As well as raising money, they also attracted a huge amount of publicity - you can read a some of press reports here and watch a brief TV news report here. Nineteenth chapter of the summary of the history of women's rugby in France, from the book "Rugger Girls"("Des Filles en Ovalie"), written by Jacques B. Corti and Yaneth Pinilla Foreword by Serge Betsen. Published weekly(ish) by French women's rugby blog Des Filles en Ovalie. 1995 was a significant year in another area - one of politics. In the elections to the Federation, Wanda Noury was elected to the Steering Committee of the FFR - the first woman to receive this status. In truth the Ministry of Youth and Sports played its part in this small palace coup. It was necessary, according to its papers, for a woman to support the activity of the women within the Federation. Wanda Noury therefore took on the responsibility of the Women's Commission. Why her? "I was known by those at the centre of the rugby, they thought it should be me,"she says. The arrival of a woman to the Steering Committee of the FFR was certainly a significant step forward in the long journey of the women's rugby, and was the initiator of new changes. One of them concerned the organization of the Championship. "It changed constantly because everything depends on the teams. At one time there were 20 teams, which made one division, then there were 35 teams and you could make a second division, after it is rose to 40 and the third division was established. The system of the three divisions are about since 2001." Let's stay in 1995. Wanda Noury, becomes, as part of the process, manager of the French team. This is the beginning of a very rich career in the FFR. But, while a step forward, the arrival of a woman to the Steering Committee, did not solve not all the problems. This time it was Marie-Céline Bernard thought her future was threatened. "I learned in the press that someone else taken my place. Perhaps they (FFR) felt that I had probably gone on long enough?" Jacquelines Bonnieu-Devaluez took her place as the head of the French team, to work with Jacques Macou, who had been in position since 1993. Instead Marie-Céline Bernard in 1995 was entrusted with a new mission: the organization of the Championship of France for the Southeast region. She also participated in the implementation of the inter-regional selections to find girls able to play for France or France A. After the next elections, in 1999, this activity would be entrusted to Nicole Mas. Extract from the book "Des Filles en Ovalie", Editions Atlantica (2005), Written by Jacques B. Corti / Yaneth Pinilla Foreword by Serge Betsen. Any hopes of seeing the World Champions in action any time soon must have been severely dented today with the news that the New Zealand RFU made a whopping loss of £4.5 million last year. With New Zealand authorities not noted for putting vast amounts of money into women's rugby at the best of times, the likelihood of their helping the World Champions get together to play anyone seems small - unless, presumably, someone else pays. Most (about £4 million) of this pretty impressive deficit is, apparently, due to their preparations for hosting the men's World Cup later this year - so any hopes for a repeat of last year's Women's Rugby World Cup final may depend on the financial success of its big brother. Fancy touring the world playing for England? A year later than most of the rest of the world, England have finally woken up to the importance of Sevens Rugby. With the 2013 World Cup just around the corner (what is effectively the first qualifier, in North Africa, takes place this weekend) and then the 2016 Olympics following on soon after, many countries around the world have been concentrating on Sevens since last year's World Cup ended. Some nations - such as Australia and Brazil - have said that they will be concentrating almost exclusively on Sevens for the next few years, while others - including Netherlands, France and Canada - are clearly selecting their best players for sevens ahead of their XVs team. In a bid to catch up RFUW have announced Open Trials for any adult players (ie. aged 18 or more on the day), which will take place at Surrey Sports Park in Guildford on 15th May. Anyone interested needs to compete and return this form by 7th May. There is NO requirement to have ever been part of any national or regional squads or groups - indeed it is clear that RFUW are particularly looking for younger players who may have only just taken up the game, or who have otherwise been "missed" by the existing programmes. Syd had a great weekend at Hartpury College with the Divisional U15s, it seems. All squads rotated their players so no-one got to play in all three games, but Syd made the most of her chance to impress national selectors by scoring two tries against Midlands Division, who had previously beaten the South West and looked like they might go through the day unbeaten. Sydney's tries put an end to Midland's hopes, with London & South East running out 17-0 winners. The tournament did not have a "winner" as its aim is to spot talented players rather than identify the leading division. The best 30 players from the four squads will be given special coaching over the summer. Whether Syd will be part of the "TDG" (Talent Development Group) will hopefully be revealed during the week. Eighteenth chapter of the summary of the history of women's rugby in France, from the book "Rugger Girls"("Des Filles en Ovalie"), written by Jacques B. Corti and Yaneth Pinilla Foreword by Serge Betsen. Published weekly(ish) by French women's rugby blog Des Filles en Ovalie. The start of 1995 saw a new assistant coach technician at Tournus - Jacques Macou. Beyond personnel changes, this was a period of poor central management, with the girls having to make things up as they went along. The effect on the French team was to wear down the enthusiasm of players. It was now five years since women had joined the Federation and fundamental improvements were not obvious to the game's leaders of the time. The second European Championship - the first held since the women joined the FFR - took place in Treviso in 1995, and illustrates this lack of interest by federal authorities in, amongst others, the French team. "We knew that the European tournament would be held in Italy, but no information came from the Federation", recalls Bernard Marie-Céline. "Then, only three weeks before the competition, the FFR asked me to put together a team. I spent several days on the phone finding girls who were available. In the end I could not find 22 players so we went with 20." So, between 12 and April 16, what was called the "First FIRA Women's European Championship" was played, a tournament that is now annual. The French finished second behind Spain's women*, who won the final 22-6. The following year the French took their revenge, winning the title in Madrid, beating the Spanish 15 to 10. *Netherlands and Italy also took part in 1995. In 1996 the four teams were joined by Germany - Russia also entered, but withdrew at the last moment, resulting in a rather chaotic tournament! Worcester U15s had an unfortunate experience on a tour of Scotland. They arranged two games, then found that the first team they met only have seven players, while the second team failed to show up altogether. Curiously this is not the first report of problems faced by junior teams touring north of the border - there were some complaints recently from a junior team that went to Scotland to play tag rugby and found the local sides playing to to rather different law interpretations. It all goes to show that, as far as rugby is concerned, other parts of the UK can be just as much "foreign countries" as anywhere overseas! Finally dreadful news from the US, where Texas University student Stephanie Flores has died following an injury she received playing rugby for her university in Kansas last Sunday. 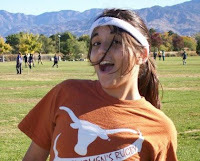 In what sounds like a freak accident, Stephanie - captain of the university team and a member of the state representative XV - was injured "during the regular course of play...a straight on tackle caused [her] head to come into contact with the ground." Over the last few years as more and more girls teams sprang up, unofficial leagues had sprung up to accommodate these teams. There were two distinct types, highly competitive leagues between clubs able to field full teams, and cluster leagues where teams clustered together to get enough girls to play a game. Not all the country was covered and not all the leagues worked particularly well. There was a county programme with counties finding their own fixtures and some running successful tournaments and there was a regional programme that had developed really well and culminated in an excellent tournament at the end of the year. In summary something fun to keep grass roots going and something more competitive to develop the talent. It did have a few problems in the way it took chunks out of the fixture list for those that didn't move up the ladder, but overall it was successful and fulfilling for the girls. Adjustments could have been made to it to continue its evolution. However, in one go at the end of last season the RFUW got rid of the lot. Every team was told they would need to enter a RFUW league as none of the old ones could continue. Although it was not compulsory to enter, teams felt obliged to enter to ensure fixtures. Teams reluctantly did this without knowing playing numbers in case they couldn't find fixtures Teams were placed in leagues and corresponding fixtures were published, but it was evident from the beginning that many of the clubs registered didn't have the playing numbers to fulfil the fixtures, or were not at the playing level of other teams in the league. In prior years lists of teams were published in categories relating to the number of players. These clearly showed few clubs with large playing squads and many who would struggle to field a 7's team. The league rules were lifted from the Women's league where there is a structure for relegation and promotion, something that is not present in the girls leagues and not appropriate. The additional try bonus point system also encourages teams to rack up points, something that doesn't help development. This has led to uncertainty in the league winners list published on the Letchworth Blog. In fact although some of these teams currently top their leagues now all the games have been played, the RFUW will be adjusting some points and in some leagues there will be new winners. Leagues also cause problems to teams emerging during the season, how do they find fixtures when clubs already have a fixture list in place? So we see in many leagues vast discrepancies in results and in many cases teams not playing a single game. What has happened to these clubs and their girls? Some have clearly folded, girls have quit rugby for other sports. This has been detrimental to the development of the girls game. Hopefully some clubs will return. What leagues do is introduce competitiveness. Often this is due to the egos of the coaches involved, but witness the introduction of junior leagues in Boys' rugby. This has had an effect on fixture lists, relations between clubs and the development of boys as winning is vital to avoid relegation. At least with the boys' leagues there are enough to have promotion and relegation to ensure teams are in a fairly competitive environment. This is not the case with girls rugby as there are not the number of teams to do this. Examination of the effect of the introduction of the men's leagues shows a similar problem. Many clubs now run fewer teams. Clubs have folded as playing numbers diminished and old club rivalries were lost as teams moved up into different leagues. There is now a large influx out of the lower leagues into merit tables to find the lost ethos that competitive league rugby destroyed. We need more girls in rugby and more clubs, the base needs to be very broad to support the ultimate goal of a successful world cup winning England team. However, that elite few need to be supported by a fun rugby many. There should be a fundamental principle that club rugby is about developing girls and supporting the growth of and increasing the number of clubs. We do not want to see the emergence of super teams who attract the best players in each county and who de facto become the county team. We want to see clubs growing numbers and new clubs emerging. The strength and support for a competitive league structure with promotion and relegation is not there yet. Concentration should be on growing the base. The leagues should be more flexible to allow new teams to join during the season. Try bonus points should be abolished, with a simple 4 points for a win 2 points for a draw and 1 point for a loss. Games should automatically stop after a margin of 30 points and a new game started with more evenly matched sides. Stronger clubs should be supporting the developing clubs as it is in their long term interest. Alternatively the old merit table idea could be used of ranking teams by the number of games they have won as a percentage of the games played against other teams in their league, so late joiners are not disadvantaged. The move to Divisional rugby from the regional rugby has been good news for clubs as fewer girls are lost on average. But the divisional structure needs to be sorted out especially at U18 level. Are they going to be like the U15's a couple of practice matches then a tournament, or like the Women a simple league where everybody plays everybody else? My preference would be for a tournament at both U15 and U18 because the girls really enjoy them. More competition needs to be introduced at the County level. The CB's throughout the country need to be running county girls. Within each division there should be one or two leagues and teams should play each other to win these. This would be a replacement for the sadly missed county festivals from prior years. It would also give divisional coaches the chance to watch girls in competitive games and help them select the divisional nominations from each county instead of the nomination mess that happened in some divisions this year. Girls are not boys or women! They need to be coached slightly differently. They play the game slightly differently and they need a different structure to support it. One size doesn't fit all. These carry on, needless to say, pretty much as before. There is some slight hints about maybe future tightening of entry requirements - lines like "if you have struggled for any reason as a club consider if it may be better for you to play friendlies" would seem to suggest some concerns based on the number of walkovers this season, for example. 11 Sundays listed between 2nd October and 15th April... which also implies leagues no larger than six clubs (several this season had eight). Comment: The trouble remains that this all betrays a lack of understanding about how junior clubs work. Most clubs will not have much idea about how many players they will have next year - least of all at U15s - and whether a club has struggled (or not) this season is no guide whatsoever to what they will do next season. I guess RFUW would argue that they need an early entry deadline to organise the leagues. And that is true - but it just goes to show that the system itself is wrong for the game as it currently stands. It is more sensible, surely, to design the system to match the game, not bend the game to match an inflexible system? Much as this season - one training/selection/development day (25th September), two matches (16th October and 6th November), and a County Festival (or festivals?) on 20th November. As above. Trials will be 22nd January. U15s get a match (19th February), two training sessions (12th February and 25th March), plus a festival (1st April). U18s also train on 12th February, then play three games on 19th February, 18th March and 1st April. Returns to a reasonable date (it was originally planned that this year's 7s would have been next weekend! ), and two weekend are set aside for "local tournaments" in the lead in. Which is good - RFUW have clearly learnt that there are some rather successful independent events (like Herts 7s) that need preserving. This is new (or maybe not, actually). Basically on 22nd April 2012 there will be "five festivals held across the country - clubs can choose which they want to attend. This festivals will be split for developed club and developing clubs". No indication yet whether these will be for 15s, 13s or 10s or what - but what is striking is that this sounds very like the good old National 10s which were also based on "festivals held across the country" where clubs could "choose which they want to attend". However, that quibble aside, this is a great idea. It'd be nice if there were more, spread across the season, as everyone loves a festival, but its a start. And if they work maybe they will be extended! And finally, you never saw this coming. Truly this is from way left-field and opens stacks of questions (and cans of worms), but could be great. Letchworth girls - and a few ex-Letchworth girls (Rosie, Mel and Nikki) - took a trip to Cheshunt last Sunday to try out rock-climbing and kayaking. Reports back say that it was a great day out and a good time was had by all. After this festival the best 30 U15s will be chosen to attend a special three day training camp at Wellington College in August. "not eligible to wear the Rooster"
Seventeenth chapter of the summary of the history of women's rugby in France, from the book "Rugger Girls"("Des Filles en Ovalie"), written by Jacques B. Corti and Yaneth Pinilla Foreword by Serge Betsen. Published weekly(ish) by French women's rugby blog Des Filles en Ovalie. In 1991 France took part in the first World Cup. From April 6 to 14, 12 teams competed in Wales: Canada, Spain, USA, England, Holland, France, Italy, Japan, New Zealand, Britain, USSR and Sweden. Les Bleues finished third behind England and the United States, who won the title. The French team had yet to find its proper place within the FFR. For this World Cup - the first global event of the women's rugby - Marie-Céline Bernard had written to Albert Ferrasse for permission to participate. Despite this even the little details suggest that nothing was done to support the girls: on their singlets they were told that they were not yet eligible to wear the rooster, so a simple blue, white and red patch had to make do. This lack of true support for girls was a continuation of what had been experienced since federalization. Nathalie Amiel still finds it funny to remember the first international match under the FFR, in 1990. "It was pretty incredible", she said. "Marc Gosse [the FFR appointed coach], was accustomed to big hotels. But with girls there was no budget for it. For our first match in April 1990, the French players and officials stayed in a hostel. The girls, we slept in one room, and officials on the floor in a large room where there was the fireplace. Nothing had been organised to eat. We would have had to leave for the game after a bowl of soup and a boiled egg, but fortunately someone from Gennevilliers [SW Paris] got us some pizzas. We still won. * "
In 1994, three years after the first, the second World Cup was organized (since then, it has taken place every four years). The competition took place in Scotland and this time Marie-Céline Bernard teamed up with Gerard Ricq, who joined the French team in 1992. France finished third again. *France only played one international in 1990 - beating Netherlands 10-0 away - so the hostel and pizza restaurant would probably have been somewhere in Amsterdam! Arguably the most unpopular initiative the RFUW have ever introduced (I never met nor heard from anyone last season who wanted them, though most did not wish to be quoted! ), the first season of the RFUW's U15 and U18 leagues has now pretty much reached its end. So - triumph, or disaster? Truth be told, of course, we will never know as it is impossible to say how the game would look if Twickenham had not forcibly axed every existing competition and "encouraged with extreme prejudice" (for want of a better term) most of the more active clubs (54 U15s and 57 U18s) to join their new leagues. In addition, RFUW never really said what the aim of the leagues was - at least not in any way that would reveal measurable targets. Even if we were to measure the number of active clubs or players, before and after, who is to say that things would have been any different otherwise? As it was the leagues ran, champions emerged, and so - on that basis - the competitions "worked". However, the competitions were not without their problems. Of the 608 leagues games that were planned, 179 ended in "walk-overs" - nearly 30% - and another 77 games seem not to have taken place (ie. no scores were reported), so only just over half of all the planned fixtures were played and are included in the final league tables. Some leagues did better than others, it has to be said - 90% of the games in South West South U18s were played, as were over 80% of the games in North West U15s and South West South U15s (a legacy of the successful South West leagues perhaps?). However, London Irish's South East U15 win was based on a league were barely one game in three was played, while Morwick lifted the North East U18 leagues on the basis of just three completed games (out of a planned 20). This was only to be expected, not least because of the very early entry deadline RFUW adopted, which meant that many teams will have (and to my certain knowledge did) put in teams "just to be on the safe side", without having any idea what they player numbers would be like. And, truncated though Morwick and London Irish's season will have been (and having your fixture list wiped out by walk-over after walk-over cannot be fun), you can only beat what is in front of you. And its a pretty safe assumption, after this first year shake out, that there will be fewer entries next year by teams unable to play all of their games. Of rather more of a concern, however, has been how competitive these leagues have been. Or maybe haven't. Over half of all games - 58% of U15 matches and 51% of U18 games - were decided by margins of over 30 points (ie. a difference of at least four tries). Scores in the 70s and 80s were not unusual - indeed there were several wins by over 100 points. Midlands East U15s was the most extreme example, with Welwyn winning the league with an average victory margin of over 55 points per completed game, while Ashby finished bottom having lost every game by an average of near 56 points. But this was not in any way an isolated example of one-sided rugby. Alnwick U15s cannot have learnt a great deal after being trashed by an average 58 points per game, but equally Ellingham and Ringwood U18s average victory margin of 52 points is unlikely to have developed that team very much. Aylestone St James ("Jimmies") U18s lost every fixture by an average of over 50, while Exeter Saracens strolled to wins by an average 45 points per game. And so on, and so on. In 11 of the 18 leagues, clubs can be found winning or losing every game by what must be damagingly high scores. But that is what you get with leagues. Weaker clubs get thumped every week, but have no-where else to go, not least because better clubs - seeking silverware - are not going to go send their second XV if it could lose them the title (Paviours only won their U18 league thanks due to their recording more try bonuses than Welwyn - it does not pay to take your foot off the pedal). There is no conclusive evidence that those sides being regularly thumped lost heart, though the number of walkover in some leagues increased slightly as the season went on and Exmouth U18s gave away their final two matches in South West South following (but, there is no evidence to suggest, due to) some heavy defeats. Junior rugby is about learning the game, developing players - and teams - and keeping them playing. All of these should come before win-at-all-costs - but that is inevitable in the inflexibility of this sort of league rugby. Its a simple system to understand, it makes officials jobs easier (especially fixture secretaries), and a few teams get to make some good headlines in the local press - but is it good for the game as a whole? Does it allow players (and clubs) to learn the game? Who gains when a team wins by 109-0? It would be interesting, incidentally, to know how those sides who resisted the attentions of RFUW faired this season, because (if clubs in and around Hertfordshire are typical) the answer would seem to be "not too badly". In areas with supportive county CBs perhaps there is an alternative after all? One of the great sporting fantasies is being suddenly drafted into the national team because they are (for some reason) short of players for a major international tournament. And then scoring the winning try. Its the stuff of the more predictable sport-related movies. But incredibly it seems this pretty much what happened in Hungary earlier this season. Hungary's national women's team dominate an international rugby sevens series in central and eastern Europe. In 2009/10 they played 23 games, winning 22 and drawing one. So they started the 2010/11 season with some confidence. Then, it seems, one week before the tournament, the women's team coach announced that he had set up his own team - called the Battai Bulldogs - and entered them into the league. This team included pretty much all of the existing Hungarian squad. So Hungary had no team, and no coach, a week before travelling to Zagreb to defend their title. However, they did have the U16 squad (plus coach), who had played a few friendlies against Austria the previous season, and so - with no alternatives available - the Hungarian RFU turned to these schoolgirls to wear the national colours. And so, after one training session, they were off to the pouring rain of Croatia. First up they had to play the Slovenian national team - fortunately the weakest side in the tournament. Despite the Slovenes being bigger, older, and stronger than "our daughters" (as their website calls them), they are nowhere near as quick and the schoolgirls run out 29-0 winners. Next up was the first of two Croat teams - Nada Split. "The little girls were asleep at the start" apparently, so let in an early try but still went on to win 35-5. Local team Mladost Zagreb were rather tougher, but the girls still won 22-7. And so to the final game, against the only other unbeaten side... Battai Bulldogs, the former national team who had not lost to anyone for over a year - and it was not long before the older team were ahead. The girls defended desperately for most of the rest of the first half, trying to avoid another try, until just before the break Huszti Katalin intercepted a long Bulldog pass, levelling the score. Three minutes into the second period the schoolgirls went ahead, and then on the last play a 70m break by Gyolcsos Mária finished off a 21-7 win. Sixteenth chapter of the summary of the history of women's rugby in France, from the book "Rugger Girls"("Des Filles en Ovalie"), written by Jacques B. Corti and Yaneth Pinilla Foreword by Serge Betsen. Published weekly(ish) by French women's rugby blog Des Filles en Ovalie. The transition, from AFRF to FFR, turned to confusion. The recognition of women's rugby by the FFR has not fulfilled the expectations of the AFRF, the championship clubs, or the French national team. See what happened for the Championship. For the first two years, the FFR has left the clubs to continue as they had with the AFRF. "After that, they asked us to return to the operation of sports, administrative and medical commissions". Despite the liaison work carried out by Nadine Leterre, "regional committees of the FFR did not know what to do. This situation lasted 3 or 4 years before matters improved," remembers Marie-Céline Bernard, who adds: "the clubs did not know who to write to ask for help. This very quickly became a problem." At this time the International Confederation of Women's Rugby came into the fold of the FIRA. In 1991 and 1992, the French Cup was cancelled. Only French A and B Group Championships were retained. And the national French team was not sheltered from the turmoil sweeping women's rugby. From the 1991 international season, Marc Gosse called Jean-Pierre Puidebois and Marie-Céline Bernard to lead the French team. Their predecessors only learnt these appointments from the press. Marie-Céline Bernard also recalls this episode: "I received a letter informing me that I was appointed". She was the only woman the Federation informed.